DoingTimeWithBernie.com: Corrupt Cop Convicted Felon Bernard Kerik loves black people and he wants you to know it! Corrupt Cop Convicted Felon Bernard Kerik loves black people and he wants you to know it! After labeling black people, in the form of Ferguson protesters, “animals”, “savages” and “Black Panthers”, Corrupt Cop Convicted Felon on probation, Bernard Kerik, has been liking black people a bit more since he’s been selling our book, “From Jailer to Jailed” and stumping for his dark money Koch Brothers supported 501(c)3 ACCJR. org. Poor felon Bernie Kerik has found a revived purpose and meaning to tolerating black people. It seems when it comes to money everyone is green. 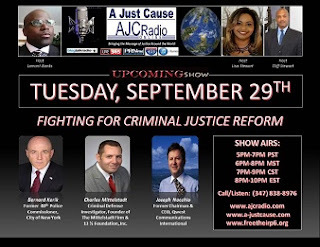 Bernie Kerik has finally hit the big time with blogtalkradio.com flapping his dumb gums with other felons of another dark money-grubbing 501(c)3 (A Just Cause), one of which escaped a child sexual assault overturned in the appellate court! Well now! Bernie Kerik has gone from cavorting with Queen Elizabeth, President George W. Bush to some thugs in Colorado.